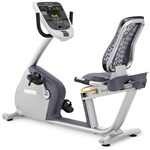 The Precor c846i recumbent exercise bike features belt drive system with a double step-up drive which gives users a smooth, quiet exercise experience. 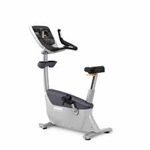 The Poly-V belt is used instead of chain which also reduces the bike maintenance. A durable, built in magnetic, no-contact generator system provides consistent resistance and reduces the also roughness, maintenance, and wear associated with mechanical alternators. 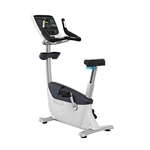 The Precor c846i recumbent bike is easy to move and the unit also features a touch sensitive display console, contact heart rate and a three piece crank. Pedals: Larger platform pedals accommodate a wide range of users. 3-piece crank: The 3-piece crank tightens positively, reducing the need for periodic adjustments. The 9/16" crank arm accepts any standard road or mountain bike pedal.